Orders are normally delivered between 8am and 6pm Monday to Friday. We always do our very best to achieve our stated delivery times but please note we cannot be responsible for circumstances beyond our control including, but not limited to, adverse weather conditions and supplier & 3rd party / carrier difficulties. Please be aware that multi case orders may become separated. Please contact us if you do not receive the balance of your order within three working days. In the event of redelivery being required Davy’s retain the right to charge an additional minimum fee of £9.95. By placing an order you are confirming that you are at least 18 years old, we reserve the right to cancel an order if we are unsure of this. Orders can be collected from any of our wine shops or bars free of charge with no minimum order. Just type the name of the bar/wine shop into the delivery address box and we will refund you the cost of delivery (if charged). Orders will be available for collection within three working days. Goods should be inspected upon delivery and any breakages reported immediately, within two days of delivery at the latest. Please call 020 8858 9147 or email orders@davy.co.uk to arrange a replacement or credit. We do our utmost to ensure every wine listed will be available to you. However by their very nature wines have limited availability, so from time to time we may run out of a particular wine or vintage. When this happens we will contact you to an offer alternative wine or send the next available vintage. Next day deliveries can be arranged for an additional charge based on weight. Pre 12pm deliveries can be arranged for an additional charge of £12. Deliveries can be made on Saturdays for an additional charge based on weight. Please contact our customer service team on 020 8858 9147 or orders@davy.co.uk for further information on any of the above. *Please note that deliveries to Northern Ireland, The Isle of Man, The Isle of Wight, The Scilly Isles and some areas of Scotland may take longer and are subject to a surcharge. View delivery costs in your area here. Please contact 020 8858 9147 if you require any further information. For deliveries outside the UK mainland please contact the team for a bespoke quote. Wines sold In Bond (IB) will not receive a 5% discount or free delivery. These wines will be subject to duty and VAT at the prevailing rates if you wish to remove from bond. Wines remaining in bond will incur storage charges of £11.95 per year (or part thereof). Handling will be charged at £2.40 per case. Onward delivery will be charged at cost. Wines are available on Sale or Return, by prior arrangement only, for orders of 96 bottles or more. Beers, soft drinks and spirits are available on Sale or Return for delivery and collection but only in addition to wine orders. All returns are at the customer’s expense. Returns must be made within 28 days of original delivery and goods must be in a resalable condition. We reserve the right to only accept back up to 40% of the original order. For further details please contact a member of customer services 020 8858 9147. 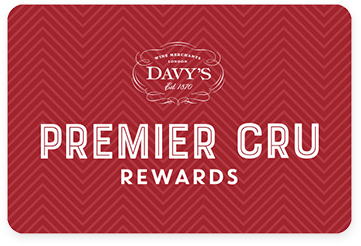 Free glass loan is available within Greater London but only for events where the entire drink order is placed with Davy’s, with a minimum of 48 bottles of wine. A deposit of £1.50 per glass is taken upon delivery, which will be refunded when returned. Any breakages must be paid for. Glasses must be returned clean and polished otherwise a cleaning fee of £1.50 per glass will be incurred. Returns are at the customer’s expense. You may cancel your order at any time until seven working days after the day the goods are delivered. Cancellations should be made in writing or by email at orders@davy.co.uk. Where goods have already been delivered there may be a charge to cover the collection. Wines must be returned unopened and in their original condition. It is your responsibility to keep the wines safe until collection is made. Where a payment does not meet our required security checks we reserve the right to cancel and credit in full.